Tim Burton’s 1996 sci-fi movie Mars Attacks! 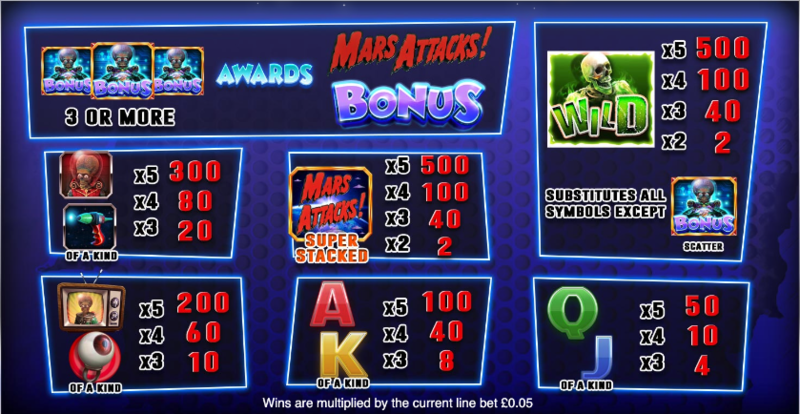 was a colourful and comic look at the alien invasion genre and it’s taken more than two decades to make it onto the spinning reels courtesy of Blueprint Gaming; multiple bonus features and a progressive jackpot are on offer here as you’ll find out below. Mars Attacks! is a five reel slot with three rows and twenty fixed paylines; through those transparent reels there’s a view of the White House at sunset as flying saucers spin overhead. The higher value symbols are alien-related and include, the logo (which appears stacked), a goggle-eyed invader, a ray gun, a television broadcasting their message and an eyeball; J, Q, K and A represent the lower values. The wild symbol is a frazzled, green skeleton which will substitute for all others to help form winning combos except for the alien leader bonus symbol. Radiation Blaster – extra wild symbols are added to the reels. Mega Shrink Ray – the reel shrink to fit in more symbols, meaning there are now 3125 ways to win. Abduction Beam – a new set of symbols are beamed onto the reels. Expansion Cannon – a mystery symbol is added in view which will spread to other positions; when it stops it will transform into matching ones. Sub-Zero Lazer – a winning combo will be locked in place and the reels will spin again – this continues until there are no additional winning symbols. This is triggered by landing at least three of the bonus symbols anywhere in view and you’ll now be asked to pick a geographical zone from the five on offer to award one of five features. The features are potentially more valuable as you move down the list (below) so if the bonus is triggered with four symbols, Spy Hunter will be removed from the possible choices; five symbols will take you straight to Final Stand. Spy Hunter – pick from the board positions to find a martian t collect cash or humans, three of which will end the round. The Martian Ambassador will award a large prize and end the round. We Come In Peace – pick from containers to fill the banks on either side to win a multiplier value, Big Money (which ends the round) or an upgrade to the multipliers. Finding the Martian Orb also ends the round. D.N.A. Analysis – awards five free spins in which D.N.A. wilds transform other symbols into wilds and double their height. Martian Takeover – awards ten free spins with a Roaming Robot Wild which may turn all symbols wild and then step one place to the left on each spin. Final Stand – awards unlimited free spins in which special symbols on reels two and four will advance either the humans or martians along a progress bar; humans increase the win multiplier and martians remove low value symbols. Once a bar is completed the round is over. Mars Attacks! 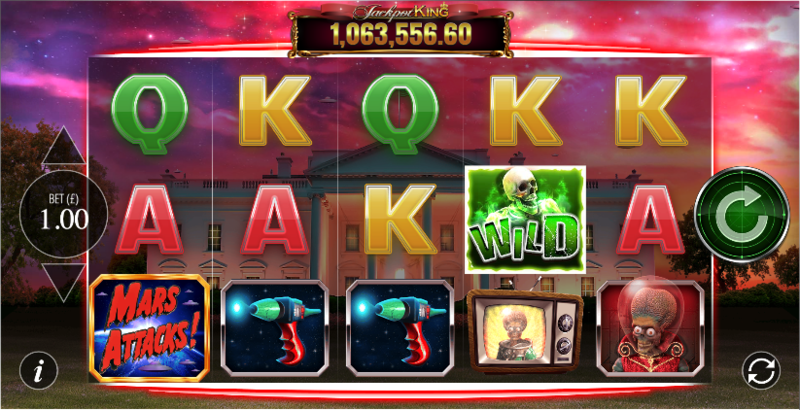 is part of Blueprint Gaming’s Jackpot King progressive jackpot series and this feature is triggered by landing five jackpot symbols on the reels. You’ll then play a reel set where the aim is to collect crowns before the round ends – manage at least 15 and you’ll get to spin the wheel of fortune which could win you the progressive jackpot. What’s not to like here? Reel modifiers, an in-depth bonus round and a progressive jackpot along with the sights and sounds of the original movie – you won’t be disappointed.